If that picture doesn’t make you want spend the afternoon indoors nurturing a beef stew into supper, I don’t know what else would. I had to give myself a pep talk to get dressed and outside to escape the cozy abode this morning. I whined to myself that it is cold, the roads are slick and bockety, people in white diesel pickups are driving like screw balls, and the last thing I want to do is get my pant legs wet. 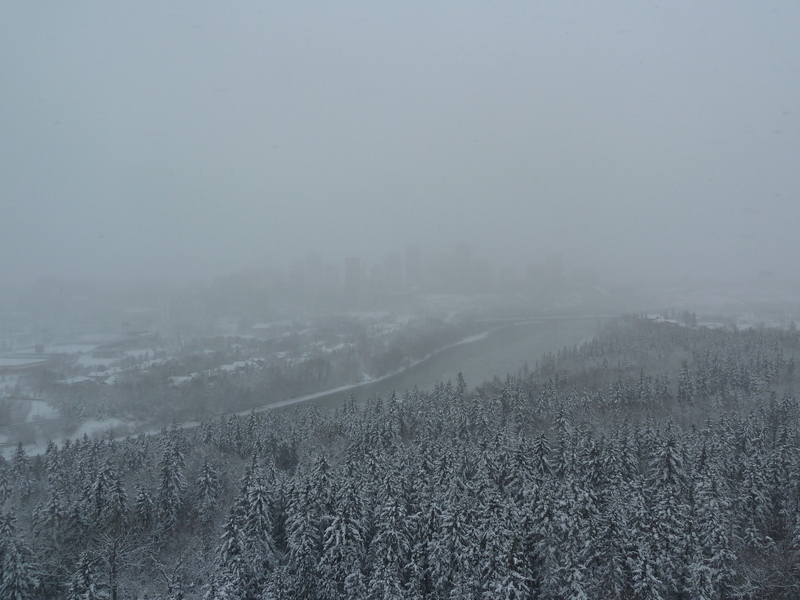 But I am a prairie girl, and I have driven on Deerfoot Trail in Calgary in conditions worse than this, WITHOUT SNOW TIRES, and felt quite mighty. I made a 60 minute hike home in knee deep snow on November 1 with our first big dump of the season, trudging through squidgy snow and ice, pink cheeked (both sets), hair iced up and feeling like Mr. Ingles walking into town to get Ma a bolt of gingham fabric and a sack of sugar, and the girls some stick candy. It was an invigorating trek and arrived home smelling winter fresh. Today, with my remote car starter, snow tires, proper boots, gloves, warm winter coat, ice scraper and brush had no excuse to stay inside. I went into town in my toasty warm car and picked up fresh baked bread at The Boulanger (formerly Tree Stone), had coffee with husband at Transcend, stopped in at Wild Earth for beef, onions, shallots, potatoes, mushrooms, celery, carrots, chocolate, potato chips and cookies for tea (it’s going to be a long winter and this stuff is for the pantry for those nights when it’s too dangerous to step outside and you just need something to go with your tea). The fact that I’ve already opened and sampled the chips and chocolate is another matter. Once all the groceries were unpacked and put where they belonged, I cracked my knuckles (in my head I imagined I cracked my knuckles, it is a skill I’ve never learned to do), and got stew making underway. First I checked the internet and found a plethora of beef stew recipes. I liked Jamie Oliver’s Jool’s Favourite Beef Stew recipe best out of all the ones I read, mainly because he is an advocate for NOT browning the stewing beef first. I know! I feel the same way! How can that be? You are ALWAYS supposed to brown the meat first. But I have a nap to take, and browning the beef takes time. So I used Jamie Oliver’s recipe as my muse for my own beef stew. Melt a knob (a big tbsp) of butter and a glug and a half of olive oil. Add your onions, celery shallots and cook for a few minutes until soft. Add the garlic. In a large bowl toss your beef cubes with a sprinkle of flour, pepper, salt, thyme, rosemary and oregano. Add to the pot. Stir. Add your carrots, potatoes. Stir. Mix up your beef broth, add the tomato paste, stir, then add to the pot. 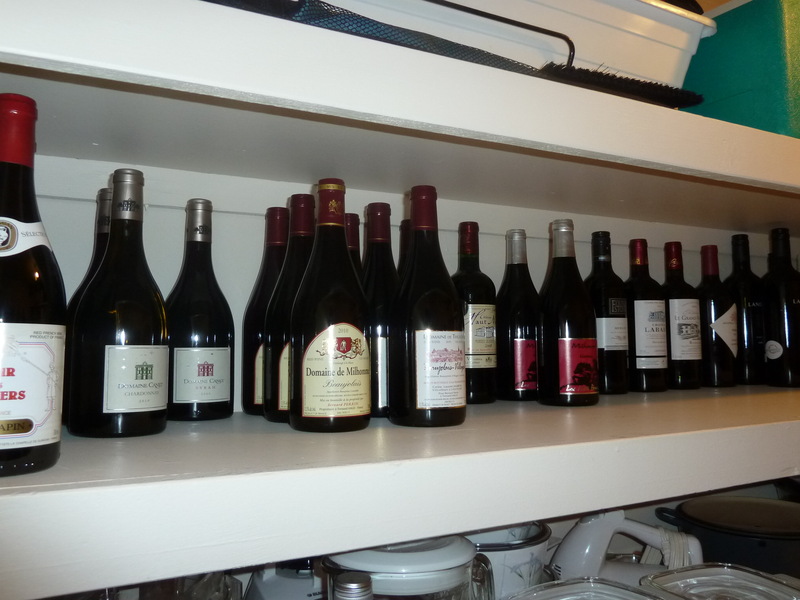 Our wine supply is getting low. That’s a joke people. A joke! 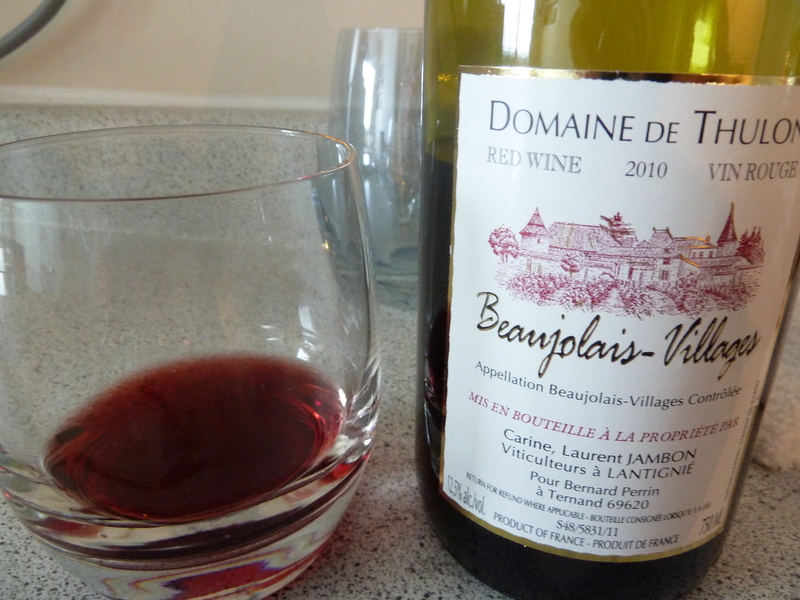 Open the bottle of French wine, sample it to make sure it’s delicious. Sample one more time to make absolutely certain. 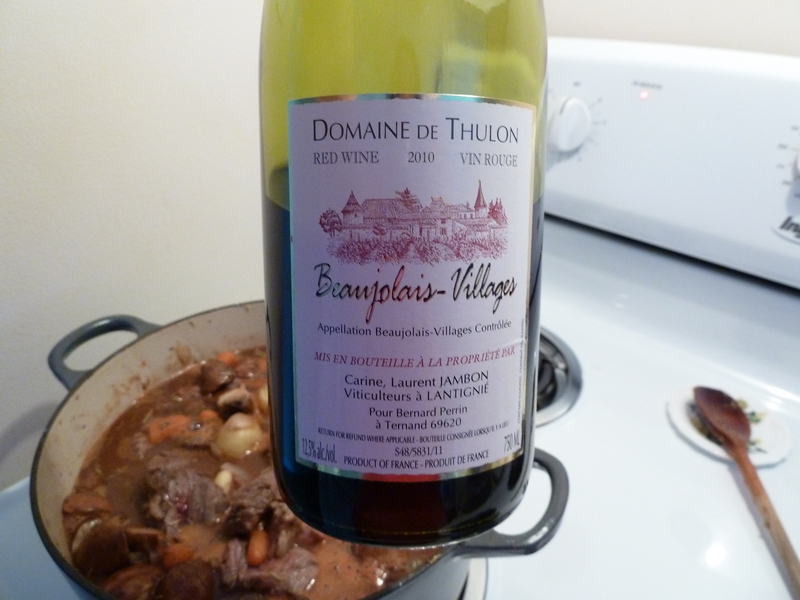 Pause, reflect on how wonderful life is, then empty half that bottle of wine in your stew. Wipe wine splatters from wall. Stir with love. Let sit on the stove until it comes to a boil. 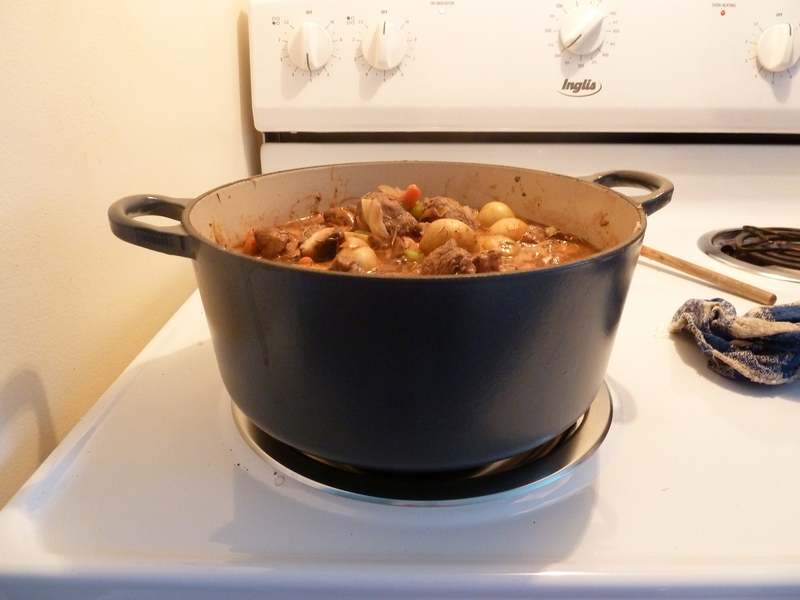 When it’s merrily burbling, put the lid on your pot, turn off the stove, and stick the pot in your preheated 300F oven. 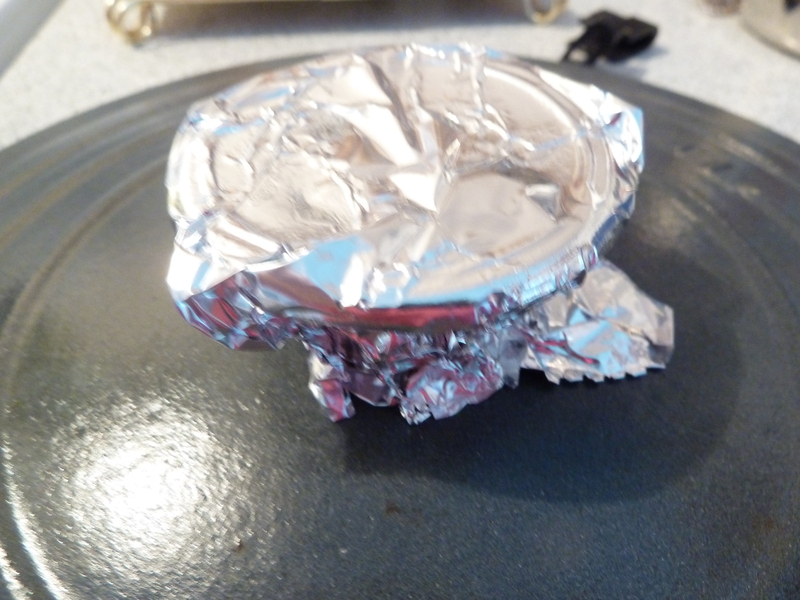 If you have a Le Cruset, don’t forget to put a bit of aluminum foil on the knob on the lid. Leave the stew alone, in the oven, for 3 to 4 hours. It’s done when the meat falls apart when poked at with a fork. Serve in bowls along with the freshest bread you can find. A glass of the left over red wine would be perfect to accompany the meal (providing that half bottle of wine survives until supper time). Previous Post Being Canadian Means…. Your “Little House on the Prairie” analogy made me laugh out loud with delight! Jamie Oliver doesn’t brown his stewing beef? My Gawd, what is this world coming to? The young whippersnapper. Have never put a stew in the oven – good idea to try next time.